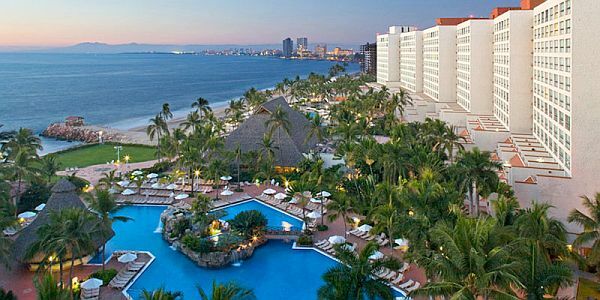 The Puerto Vallarta English speaking Alcoholics Anonymous Serenity Group will host their 14th annual 'Sobriety Under the Sun' AA convention at the Sheraton Buganvilias Resort from January 22-24, 2016. 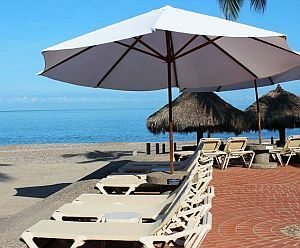 Puerto Vallarta, Mexico - The local Puerto Vallarta English speaking Alcoholics Anonymous Serenity Group combined with Al-Anon participation will soon be hosting their 14th annual "Sobriety Under the Sun" AA convention. The convention was relocated last year to the luxurious Sheraton Buganvilias Resort and Convention Center in the "Hotel Zone." The venue was excellent and the conference will be held again at the Sheraton Buganvilias from January 22 through January 24, 2016. This year's theme will be "Solving Problems Using Spiritual Principals." There will be four main speakers, three from the AA program, and one from the Al-Anon program. The scheduled speakers from AA: Keith D. of Yorba Linda, CA; Deb H. of Fullerton, CA; Kent C. of Sandusky, OH; and the Al-Anon Speaker: Sue D. from Yorba Linda, CA. Convenient online registration is available at aapvconvention.com until January 16, 2016. However, on site registration for the convention will also be available beginning at 2 pm Friday and continuing until late Saturday, along with hotel packages for those who wish to stay at the resort. Prices for rooms have been set at the lowest price available anywhere. Expected to attend are close to 400 recovering alcoholics and Al-Anon members, most coming from the United States and Canada, along with seasonal visitors and full-time residents of Puerto Vallarta. Large speaker meetings, discussion groups, workshops, dinners and social events are all planned for the convention. An all-volunteer committee has been meeting weekly for the last few months in order to present the best possible conference for attendees. There will be registration tables, merchandise tables, literature tables and a "Leave a Tile" table; all of which will be open except during the main speaker meetings. The convention begins Friday afternoon at 2:00 pm with AA and Al-Anon meetings followed by a "Meet and Greet" at 7:00 pm. The opening night speaker meeting begins at 8:00 pm. Afterward, there will be an open AA beach meeting at 10:00 pm. On Saturday, the day will start at 7:00 am with a sunrise open AA beach meeting and there will be regular meetings and workshops throughout the day, both AA and Al-Anon, from 8:00 am until 4:00 pm. At 9:30 am until 11:30 am all four speakers will hold a speaker panel on the 12 Steps. The Al-Alanon opening speaker will be will be from 1:00 - 2:30 pm culminating with their traditional countdown to determine those with the least and most time in the Al-Anon program. At 6:00 pm, the Sunset Banquet dinner will be held outside on the Sheraton dining patio, which boasts a world-class ocean view (tickets are required and it is recommended to register early as the dinner always sells out), followed by the main speaker at 8:00 pm. At 9:30 pm, there will be our traditional Ice Cream Social. And for those who wish to conclude their day with a meeting, there is an open AA beach meeting at 10:00 pm. Sunday morning begins with another open AA beach meeting at 7:00 am, followed by a complimentary continental breakfast for all attendees at 8:00 am. The Sunday morning AA Spiritual meeting will be at 9:00 am, followed by the final speaker meeting at 10:00 am. Following that will be the traditional countdown of years in recovery. The individual AA member with the most years of sobriety will present a signed "Big Book" to the individual with the least amount of sober time. This is a favorite of all conference attendees. The conference will then come to a close at noon. For those lucky enough to be staying longer there's a "Sober Cruise," which was introduced years ago and has become a favorite among members. This is an opportunity to spend the day at sea cruising and whale watching, then a stop at one of Banderas Bay's most beautiful beaches, unreachable by land, for an AA meeting on the beach. Breakfast and lunch are included. The cruise will be on Monday, January 25th and will depart the cruise ship (Maritime) terminal at 9:30 am and return at about 6:00 pm. The cost will be $45 USD at the conference registration table or $50 USD at the dock. Seating will be limited to 150, so be sure to register early and not be left ashore. Over thirteen years ago, a small group of local AA members formed a convention to celebrate their sobriety and invite the rest of the world to join in the celebration. Conventions are common all over the world and the group felt that Puerto Vallarta would be an ideal destination to host a convention. 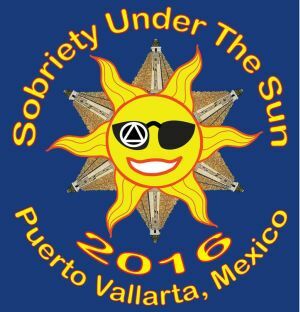 The first in 2002 was actually named "Soberfest 2002" and the name was changed to "Sobriety Under the Sun" the following year and was then supported by members of the Serenity Group of Alcoholics Anonymous and the Al-Anon groups in Puerto Vallarta. We are now celebrating Sobriety Under the Sun for the 14th year and each year attendance has increased. Alcoholics Anonymous was founded in 1935 by two alcoholics who discovered that one alcoholic can best help another after repeated trips to hospitals, jails and churches all failed in efforts to help hopeless alcoholics to stop drinking. Four years later, in 1939, the Alcoholics Anonymous book, or the "Big Book" as it is fondly called, was released in print. Only 100 recovering alcoholics were members at the time and the first 164 pages of the book have remained unchanged. Currently, millions of once-suffering alcoholics worldwide are AA members who enjoy freedom without alcohol and are leading exceptionally productive lives. Alcoholics Anonymous is known as perhaps the greatest social movement of the 20th century that helps individuals at no cost. All AA groups are self-supporting through meeting contributions. In June of this year, Alcoholics Anonymous celebrated its 80th birthday in Atlanta with upwards of 70,000 people attending. Strange, but true, in Mexico the first group was an English speaking group formed by ex-pats in 1946, and it took ten more years before a Spanish speaking group surfaced. The success and growth in Mexico was phenomenal, currently with close to 20,000 Spanish speaking groups in existence. According to a long-term local AA member in Puerto Vallarta, who is anonymous in accordance with the spiritual principles of the program, the first group, named the "Serenity Group" sprung up in 1966 in Gringo Gulch and met in rotating homes. Twenty years later, in October of 1986, the "Serenity Group" opened its doors on the second floor at the Cine Bahía on Insurgentes Avenue, which became home to the Puerto Vallarta Alano Club in 1994. In 2009, the Puerto Vallarta Alano Club moved to its new and current location. The Club is now located at Basilio Badillo 329, just a few blocks south of the original Cine Bahia location. The wheelchair accessible new location is on the ground floor located on the north side of Basilio Badillo directly across the street from Johnny's Diner. With the help from members of the club, (which is an independent entity to all 12-Step meetings,) a major reconstruction of the "New Alano Club" has proved to be one that all are enjoying. The Club has one large meeting room and one smaller intimate meeting room. Improvements and upgrades have been made and are an on-going endeavor. A Beautification Committee has recently started and contributions are gladly accepted. The AA Serenity Group now meets twice daily (9 am and 6:30 pm) at The Alano Club along with many other 12-Step support groups, including Al-Anon, which meets three times a week. All 12-Step meetings fluctuate due to low and high season, so check the recoverypv.com website for an up-to-date meeting schedule. Everyone coming to the convention is welcome to stop by and catch a meeting at the new club. Again, the website for information and registration for this year's convention is aapvconvention.com. From this site one can register online and choose from different packages or email for more information. Registration this year can be made easily with Pay Pal. The most important thing is that nobody makes any profit or gets paid as AA service is a major component in staying sober. Any extra monies are forwarded to AA service groups to further assist others in their recovery efforts. For those registering after the convention begins, registration can be made at the Sheraton Resort from the start of the conference until Saturday evening before the main speaker meeting. So, come and enjoy the weather, which is generally in the high 70's to low 80's and sunny in January and dips to a frigid 62 degrees at night, thus the origination of the convention name. Most people extend their visit to a week or more to enjoy the paradise and charm of Puerto Vallarta. Come join the international group of wonderful people that have one common purpose; to get sober, stay sober and enjoy life without the use of alcohol.